Are you looking for a hydrating face wash to combat dry skin? Dry skin can be a bit difficult to take care of as it needs nourishing skincare products that add that extra boost of moisture to the skin and make it look soft and supple. Choosing the right cleansing face wash for dry skin is a very important step in skincare as some face washes can cause further dryness and degrade the condition of the skin. Available in four sizes to choose from, this fragrance-free face wash from CeraVe has a hydrating formula and is formulated with hyaluronic acid and ceramides that retain moisture in the skin and keep it supple and soft. The formula keeps the skin clean and removes dirt and dead skin cells effectively without drying out the skin further. The non-comedogenic formula is suitable for dry to normal skin and does not cause any irritation. The price of the face wash is reasonable as compared to its quantity. Hyaluronic acid and ceramides nourish the skin and prevent moisture loss. The formula is non-comedogenic and fragrance-free so it does not irritate the skin. The size options and the price make it easy to try the face wash. The face wash does not remove makeup effectively. It can cause the skin to break out if used on very sensitive or oily skin. 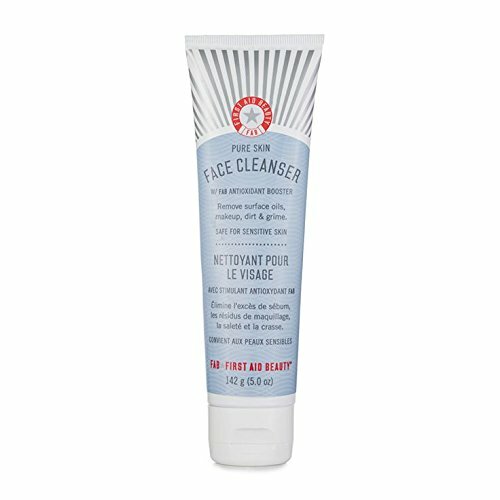 This face wash is very beneficial is cleansing dry skin as it helps the skin retain moisture and cleans it thoroughly with its gentle formula. The pump packaging is an added advantage. Formulated for very dry skin, this face wash from Dove has a creamy formula and revives dry skin in just a few days. It comes in a convenient packaging and has a non-comedogenic formula that is fragrance-free. The formula is very gentle on the skin and is free of chemical soaping agents that dry out the skin. It lathers well and cleanses makeup as well as dirt and grime easily. This face wash is also suitable for rosacea and psoriasis symptoms. The quantity is good as compared to the moderate price. The formula is suitable for very dry skin and reduces dryness in just a few days of usage. The face wash is non-comedogenic and does not contain chemical soaping agents. It lathers easily and removes makeup and dirt by deep cleansing the skin. The price of this face wash is a bit high as compared to other face washes. The formula can feel a bit heavy and greasy on the skin if not washed thoroughly. The face wash is creamy and hydrating and it works well for very dry skin. It reduces dryness and makes the skin look supple if used regularly. The formula is suitable for sensitive skin as well. Made with shea butter and vitamin B5, this face wash from Clarins has a foaming creamy formula and can be used for cleaning dry and sensitive skin. It comes in a tube packaging and is travel-friendly. The formula is suitable for daily use and a small quantity is only required for each wash. It feels very creamy and rich on the skin. The fragrance is also very soothing and does not irritate sensitive skin. The price of the face wash is a bit high but you can get it at a good discount online. Shea butter hydrates the skin and feels very creamy and rich on the dry skin. The formula is gentle enough for daily use and does not irritate the skin. It has a soothing fragrance and the quantity lasts for 2-3 months. The face wash is a bit expensive and the packaging dispenses a lot of product. It can feel heavy on the skin if used for oily or combination skin. This face wash from Clarins is great for keeping the skin clean and nourished and works on reducing the dryness of the skin. It is very rich in terms of texture and makes the skin look supple. With five sizes and six variants to choose from, this face wash from Garnier is very affordable and is suitable for dry to normal skin. The formula contains milk and rose water that clean the pores of the skin and moisturize the skin. This face wash is made up of 96% naturally derived ingredients so it is suitable for sensitive skin also. It is formulated without parabens and artificial dyes. The pump packaging is quite convenient and the quantity is very good for the price. The rose water and milk formula feels very soothing on the skin. It is made up of natural ingredients and does not contain parabens. The price of the face wash is very affordable and the quantity is good for the price. The formula is a bit greasy as compared to other face washes. It takes a few washes to remove waterproof makeup from the skin. Enriched with vitamin E, this face wash from The Body Shop is another cream-based face wash that is suitable for dry skin. It is designed for mature skin and reduces fine lines and wrinkles if used regularly. The formula does not lather but cleans the skin effectively. The face wash comes in a convenient packaging and has a flip-open cap for ease of use. The quantity lasts well for 1-2 months if used twice daily and the price is reasonable. The cream face wash is enriched with vitamin E that reduces skin irregularities. The formula is very gentle and soothing on the skin and does not contain harsh ingredients. The face wash has a soothing fragrance and comes at a reasonable price. It does not lather at all which some users might not like. The scent of the face wash can be a bit overpowering. With 2 size options to choose from, this carrot-based face wash contains organic carrot extracts, coconut extracts and Aloe Vera to repair and hydrate the skin. The formula also contains vitamin E, orange extracts, green tea extracts, and honey. It comes in a convenient tube packaging and has a creamy texture that cleans the skin well. The face wash does not lather but removes excess grime and dirt effectively. The price of the face wash is a bit high. Organic carrot and Aloe Vera nourish the skin and gently cleanse it. The formula has a creamy consistency with a natural soothing fragrance. The two size options and the convenient tube packaging make it easier to try the face wash. The price of this face wash is a bit higher as compared to its quantity. The formula stings a bit if comes in contact with the eyes. It is a very gentle face wash and contains organic ingredients that are very beneficial for the skin. Carrot extracts are rich in vitamin A and replenish the skin’s moisture in just a few days. A favourite of many celebrities, this face wash from La Roche-Posay is designed for daily use and is infused with thermal water, niacinamide, glycerine, and ceramides that create a moisture barrier on the skin. The formula does not lather and is free of parabens and sulphates that harm the skin. The face wash is suitable for dry and sensitive skin and the convenient pump packaging is easy to use. The price is moderate as compared to other face washes. Thermal water cleans the pores of the skin and prevents moisture loss. The formula is free of chemicals, parabens, and sulphates. It is a very gentle cleanser and works for normal to dry skin including sensitive skin. The face wash does not work well for very dry skin. The face wash is not easy to rinse as it does not lather well. It is an effective face wash for people with dry to normal skin and is quite gentle on the skin as well. It reduces symptoms of psoriasis and rosacea also and does not cause the skin to break out. Popular for its gentle yet effective formula, the Simple face wash comes in a pack of two and is available in 9 variants and 9 size options. It is infused with chamomile extracts, vitamin E, and vitamin B5 and is formulated without any artificial chemicals. The face wash is made with triple purified water that hydrates the skin deeply and creates a moisture barrier on the skin. The quantity and packaging of the face wash are good for the affordable price. Regular use helps to calm and soothe the skin while nourishing it at a deeper level. The 9 variants and multiple size options make it suitable for every skin concern. The formula is very gentle on the skin and is formulated without any chemicals. The fragrance of the face wash is a bit strong. It can cause breakouts if used on very sensitive skin. 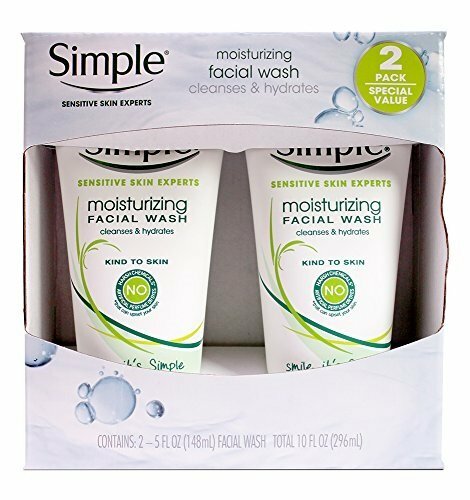 This affordable face wash is good for daily use and helps to soothe the skin with its chamomile-based gentle formula. It comes in pack of two and lasts for a very long time if used daily. Formulated with antioxidants and botanical extracts, the First Aid beauty face cleanser is designed for dry and sensitive skin. It is a very gentle face wash and contains allantoin that nourishes and soothes the skin while reducing redness. The pH-balanced whipped texture of the face wash makes it feel quite luxurious on the skin. It is available in two sizes and the price of the face wash is higher than most other brands. The whipped texture of the face wash feels soft on the skin and is easy to rinse. The face wash contains antioxidants and allantoin that enhance radiance and reduce skin irritations. The formula has a soothing fragrance and does not feel heavy on the skin. The price of this face wash is higher as compared to other variants. It can cause an allergic reaction on sensitive skin if used more often than required. It is a very lightweight face wash that works wonders in reducing dryness and itchiness of the skin. It lathers well and is easy to rinse and the whipped texture gives a luxurious spa-like feel. 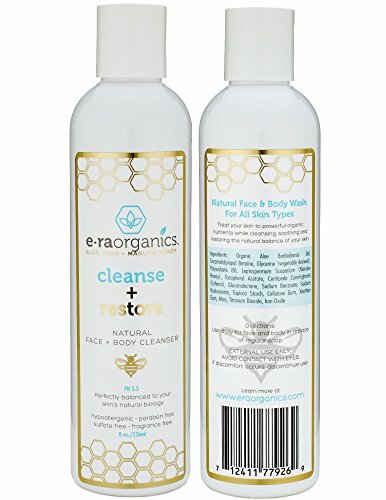 Made with organic Aloe Vera and Manuka honey, this hydrating face wash from Era Organics is suitable for all skin types and has many anti-aging benefits as well. It comes in a standard bottle packaging and is available in two size variants. The formula is free of mineral oil and parabens that can clog the pores in the long run. It has a soothing scent and works on damaged skin as well by soothing symptoms of major skin concerns. The price is reasonable if you consider the quantity. Aloe vera and Manuka honey moisturize the skin and reduce inflammation. The face wash offers anti-aging benefits and relief from eczema and psoriasis. It is free of artificial fragrances, chemicals and parabens that damage the skin. The formula contains coconut oil that might not be suitable for oily skin. It does not lather well and is a bit difficult to rinse off the skin. This face wash not only hydrates and repairs the skin but also reduces irritation and inflammation. It cleans the pores thoroughly and leaves the skin feeling clean and radiant. Always remove your makeup with a gentle makeup remover before using the face wash to get the complete benefits of the formula. Avoid formulas that contain many artificial chemicals and fragrances that can dry out the skin further and cause breakouts. Use a face wash that is specifically designed for dry skin and look for creamy formulas that hydrate the skin more efficiently than gel textures. Rinse the face wash well after lathering and do not use a lot of product that can clog the pores in the long run. Keep your skin concerns in mind while choosing a face wash and consult a dermatologist if a formula breaks you out. Use the face wash twice every day in the morning and evening to get maximum benefits and remove dirt and grime more effectively. Do not go for very cheap face washes that are filled with harmful chemicals and lathering agents that can damage the skin further. Discontinue use if the formula irritates your skin or makes it itchy as you might be allergic to some of the ingredients. Always follow a face wash with a good moisturizer to help prevent moisture loss and enhance absorption. Choose formulas that contain ingredients like aloe vera, allantoin, hyaluronic acid etc that replenish the moisture levels of the skin and make it feel supple. Do a patch test of the formula if you have a very sensitive skin to prevent further irritation. So this was the list of the top ten face washes for dry skin which are designed to hydrate and nourish the skin while reducing dryness. These face washes work very well in preventing further dryness and irritation also and keep the skin feeling soft and fresh all day long. These useful tips will help you get more benefits from your face wash and will keep your skin glowing all day long. Do you have dry skin? Which is your favourite face wash for dry skin? I have dry skin I want to know how do I retain the moisture in my skin? In fact, only drinking water is not enough to keep the moisture on in your skin’s deep layer. I suggest you have to see more external factors that cause dry skin so you can prevent your skin from dryness. Those factors are sun, low humidity, harsh soaps, wind, detergents, cold, and showers with hot water. Moreover, the skin types is also one of the factor that cause your skin dry. I suspect that which areas of our body are most dry skin? Face and hands are sensitive areas that easy to dry by external factors such as sun, wind, and etc. Not only that shins and elbows also show signs of dryness. So, I suggest you to choose face wash that suits your skin type. If you are dry skin so find out face wash that provides you more moisturizer. I can say from my experience that CeraVe Hydrating Face Wash works best on dry skin. Clarins Gentle Foaming Cleanser is great.